It is important to remember that healing is not the same as curing. Healing is helping the body, or mind, to become stronger and consequently better. Always see your doctor if you have nagging health problems or serious injuries - healing with gemstones, reiki and other alternative therapies complements, but are not meant as a substitute for medical, or psychological, diagnosis and treatment when needed. Advice given by me and through Charms Of Light is spiritual in nature and based on an intuitive reading of energy fields. This advice should be used for informational purposes only. I am not a licensed medical practitioner, do not diagnose conditions, do not perform medical treatment, do not prescribe substances, and do not interfere with the treatment of a client by a licensed medical professional. 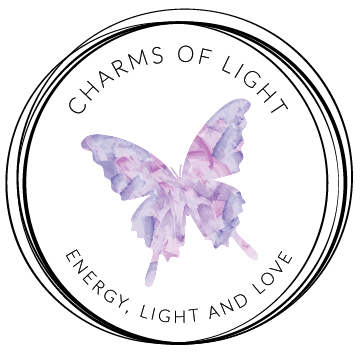 Clients bear the responsibility for any decisions they take based on the information provided by me and through the Charms Of Light website. Caryl Haxworth ~ Charms Of Light shall not be liable to anyone for any loss or injury resulting from the direct or indirect use of such information, and shall not be liable for any decision made or action taken by me or others in reliance upon such information. I obtain information from various sources which I believe to be reasonably reliable. However, I make no claims, representations, or warranties as to the information's completeness, accuracy, currency, or reliability. Due to the intangible nature of spiritual services I am obliged, by law, to state all intuitive services including, but not limited to, readings and consultations, are for entertainment purposes only. They are not to be used as a substitute in any shape or form for professional medical, financial or legal advice. Readings are not suitable for persons under the age of 18. While I try to ensure this website is as accurate as possible, I cannot accept responsibility for any inaccuracies or errors out of its control. Although I try to depict colours correctly I cannot take responsibility for differences that occur due to differences in computer / laptop screens. All measurements given are intended as an approximate indication for the size of the product.